I been very busy this weekend, finishing off some work, and then there Tilda & Co blog has taken off big time, lot's of fabulous entry's coming in all the time! So don't forget to check it out if you haven't already! I have made this card for a comp that is being hosted by Kimmie, We had to create a card or Layout using her card as inspiration. which i have also done this card for Samm Birthday Comp. 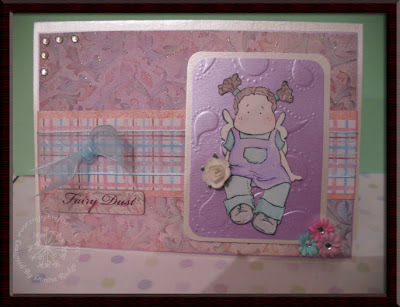 This entry was posted on 14.1.08 and is filed under Magnolia Stamps . You can follow any responses to this entry through the RSS 2.0 feed. You can leave a response, or trackback from your own site. So very adorable!! And to think, I don't have this stamp!! Aaggh!! You did a fabulous job with the sketch and thanks for taking my challenge!!! Such a pretty card Donna, i love the embossed pearl card. Gorgeous card Donna, very pretty colours, love the little sentiment, so sweet! hey... what a cutie!!! i love it. donna, yes of course i ship internationally. come on play along! Thanks for taking part in my Birthday Blog Candy challenge! Very pretty card and love the colours you've put together.